The past two Saturdays I have rented a cyclocross bike – a lovely Trek ION from Trek of Highland Park Trek ION attempted to join the group cyclocross ride. The first Saturday was warm in the 60’s I headed out with the group. We snaked through some residential streets to get to the trail enterance. We started out by doing some loops of a small trail cyclocross style. I lagged in the back and ended up off course losing the entire team. I figured out how to get to the main trail after that and headed out on my own. 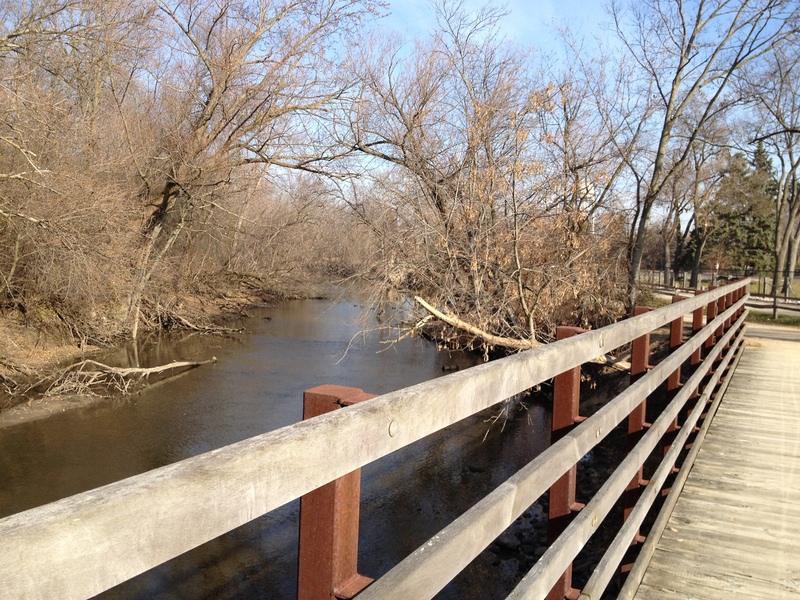 Having a wonderful 55 mile bike ride on the Des Plaines gravel trail North towards Wisconsin. It was totally awesome. This last Saturday I did the same thing. I was in the changing room figuring out what layers to wear since it was 34 degrees vs the promised 50 degrees. When I got to the front entrance they all had left! So again I found myself on my own. I packed my camel back with 2 small cliff bars, a hammer bar and a sleeve of cliff blocks. I had woken up with extremely high blood sugar (358) due to a meal of ribs, onion rings and drinking gimlets the night before. So I had bolused for correction and breakfast which I didn’t feel like eating so just had a tiny homemade paleo pumpkin muffin. I realized after I bolused that it was probably too much. I ate a gel prior to setting off. I headed down the path and felt the unmistaken low feeling. I had taken far too much insulin in the morning and the gel hadn’t helped. I tested with a BG of 65 I stopped and ate a cliff bar and several blocks, contemplating on turning back to go to the CVS for gatorade. I convinced myself that I’d be ok. 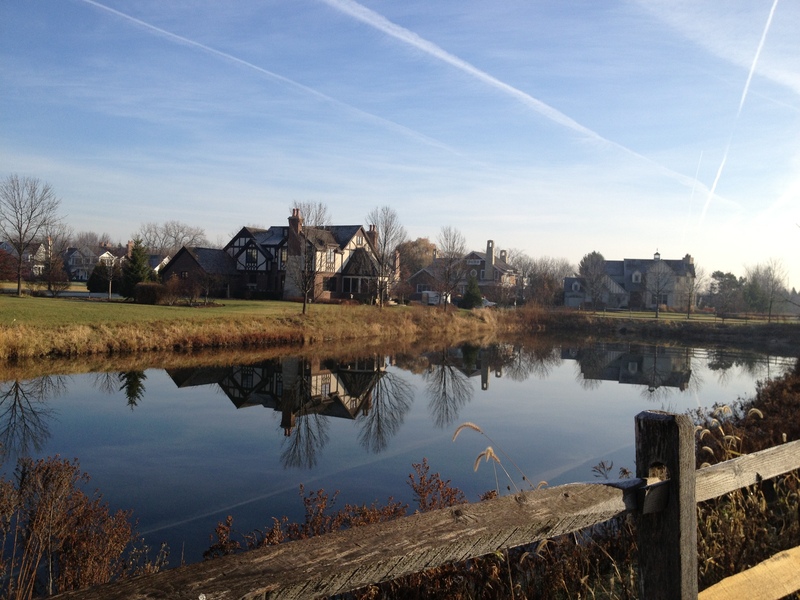 I set off again trying to find the same residential streets to the trail without much luck. I eventually found it several miles North of where I should have been. I thought of working my way backwards to see where I should have gone but decided I’d rather head on my way. This was about an hour after my original test so I tested again before setting off down the trail I was at 90. I ate a few more of my blocks. I didn’t reduce my basal because typically on long rides I increase my basal for the food so reducing just didn’t connect. I headed down the trail seeing frost on the grass and was grateful for the neck gator I threw in my bag at the last second and the thick gloves vs the thin ones I had planned on. Despite 2 pairs of socks and neoprene booties over my shoes I felt the unmistaken burn of cold toes. I wiggled them and moved them as much as possible but the cold was sinking in- the wind was cold. As I transferred on to the main trail I decided to test again – yikes 51! I ate my last mini-cliff bar and the rest of the blocks. I only had 1 bar left with about 27 g of carbs it was a hammer chocolate and cashew bar – love those. I told myself that I would ride to the small lake that had indoor bathrooms about 5 or so miles in. I arrived at the lake with cold feet. I got off my bike and walked around. I felt the warm sun on me and went into the heated bathroom. I looked at my mileage I had only gone about 17 miles. Being a fan of round #’s I told myself that I would ride 3 more miles and turn back. The warm sun at the lake gave me a nice little zap of energy. I headed down the trail and actually felt like I had ridden through a weather shield, my feet unfroze and my hands felt a little sweaty. My original goal that day was to make it to the Wisconsin border – the end of the trail . 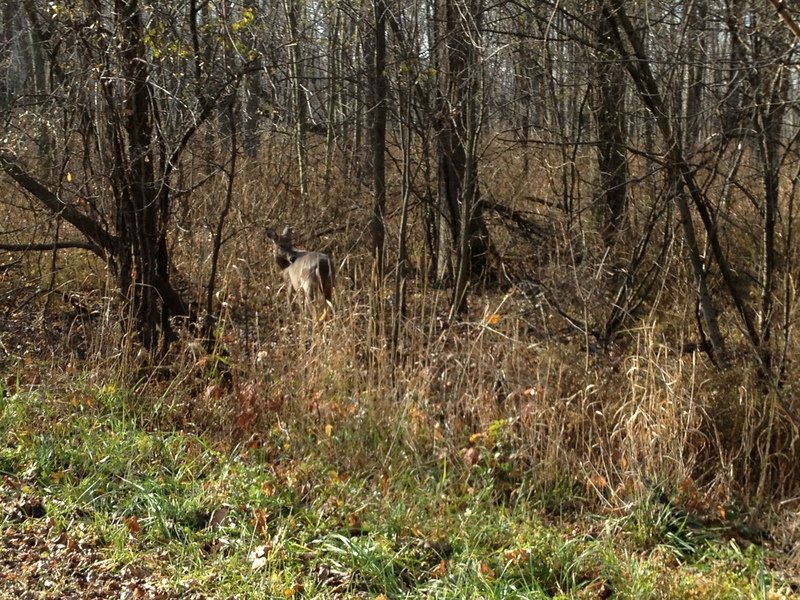 As I rode I enjoyed the forest and the wildlife! I felt great. I passed the point where I turned back the week before. 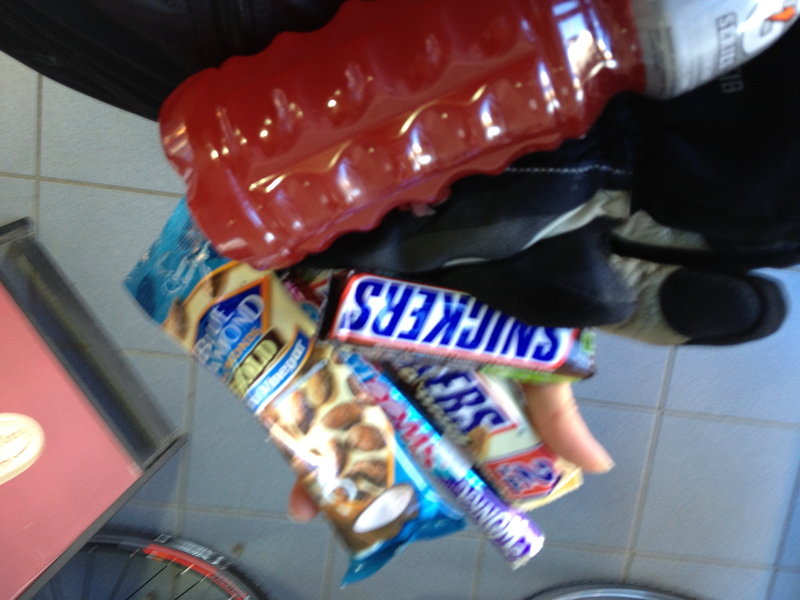 The trail crossed a couple of main streets with a couple of gas stations – somewhere to stop to refuel ! Bonus! I made it to “the cheese curtain” . I tested and was at 77. I ate my final bar and started heading back, passing some beautiful horses on the way (it is also a horse trail). Despite having the bar, I felt uncomfortable being completely out of food. I stopped at one of the gas stations and bought a stash of goodies. When your sugar is low everything looks good! I downed most of the Gatorade, ate some salted almonds and part of a chocolate bar. I headed back and stopped at the lake again. Boy, the big bolus prior to start really put me on a downward spiral! Looking back I probably should have decreased my basal on the first low but I honestly though if I ate enough it would fix itself. Anyhow, I finished the bar and went to open the second but it seriously looked stale, the chocolate had white powdery stuff on it and it just looked bad. I stuck it back in my bag just in case and downed the rest of the Gatorade. I also changed into my thin gloves. Believe it or not I was hot! As I headed down the final stretch, a paved path next to a railway, I felt myself bonking again. I took the less scenic ride home because my phone had died and I wasn’t 100% sure how to get back using the other trails. I finally made it back to the start, handed off the bike and fueled up. I tested at 86. It was a long day with lessons learned but I wouldn’t trade it for the world. I am now on a mission to buy a bike that I can ride trails on. Although the trails were not mountain biking trails I am leaning towards this so that I can start mountain biking and still ride the horse trails on the same bike. Stay tuned as I add to my growing bike family! This entry was posted in Diabetes Education, Motivation, Training, Uncategorized and tagged blood glucose, bolus, cyclocross, Endurance, Mountain Biking. Bookmark the permalink.